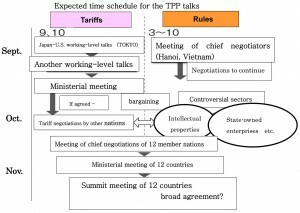 The two tracks of the current negotiations under the Trans-Pacific Partnership free-trade talks – bilateral working-level talks between Japan and the United States over tariffs on key agricultural products and the meeting of chief negotiators from all 12 participating countries to discuss issues concerning rules – both ended Wednesday, Sept. 10, with many hurdles still left before striking a deal. Japan and the U.S. began seeking chances of making progress on the ministerial level, as U.S. President Barack Obama is eager to reach a broad agreement under the TPP scheme in November. Concerns are rising over the possibility of Japan making concessions on key farm products under U.S. pressure to move the negotiations forward. In the Japan-U.S. working-level negotiations held on Sept. 9 and 10 in Tokyo, the two sides discussed such issues as the degree of tariff reduction on beef and pork and introduction of safeguard measures – raising the tariff rates back if the volume of imports exceeds a trigger level. In order to minimize influence on domestic production, the Japanese side wants to introduce less strict conditions for invoking safeguard measures, but the negotiators have failed to bridge differences, as the U.S. side wants to increase exports. Still, some say that the negotiations are showing at least a small progress, as the U.S. no longer makes negotiations stall by demanding tariff eliminations, and the two sides are debating specifically on tariff rates and the safeguard scheme. As for the multilateral talks on rules held for 10 days in Hanoi, Vietnam, Japanese government officials said although there was certain progress made, there remain a lot of issues that have to be resolved, including on a political level, in such controversial sectors as intellectual properties, state-owned enterprises and environment. Developing countries are apparently trying to keep their cards until the very end, so that they can maintain balance between benefits they can obtain from tariff negotiations and issues which could receive criticism at home. Except for the controversial areas, the 12 countries have managed to sort out technical points of discussion, and they plan to conclude discussions for the remaining issues by setting deadlines. Considering that Obama is aiming at wrapping up the talks in November at the summit meeting of the 12 member nations, the 12 countries need to hold a ministerial meeting in October, which should be preceded by a bilateral minister-level meeting of Japan and the U.S. The U.S. has already asked Japan to hold the meeting, which is expected by the end of this month. However, another working-level talks on key farm products will have to be scheduled beforehand, since the latest negotiations failed to make the level of progress which Akira Amari, minister in charge of the TPP, had set as a prerequisite for holding a ministerial meeting. Although tariff negotiations by countries other than Japan and the U.S. are said to be proceeding, there are some member countries which have only begun discussing the issue. While negotiating on tariffs, other member countries such as Australia and New Zealand, which are major exporters, are carefully watching how the Japan-U.S. talks are turning out to be. But the U.S. is unlikely to make any compromises prior to the midterm elections in November. Developing countries cannot make concessions in the negotiations over rules unless they strike a deal on tariffs. 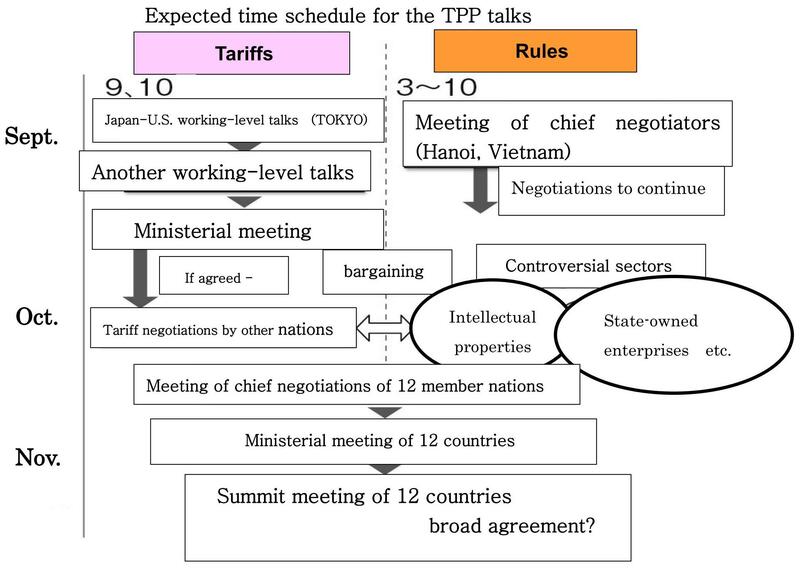 The fate of the TPP talks depends on the outcome of the Japan-U.S. talks. This entry was posted in Trade Talks and tagged Focus. Bookmark the permalink.